24Kt Gold Backed Fish Eyes. 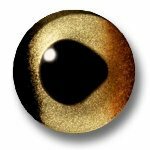 The iris blends with the gold backing to create a spectacular live freshwater fish look. These are competition quality eyes.